Our VISA Credit Cards are designed to give you freedom and flexibility when making purchases or payments. 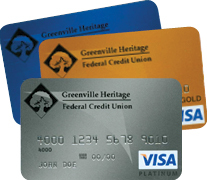 Click here to apply for a Greenville Heritage FCU Visa. As of October 1, 2017, your Greenville Heritage FCU Visa debit and/or Visa credit cards now offer the automatic Visa Account Updater Service (VAU). This is a free service designed to make using your Visa cards for recurring payments more convenient than ever. What is Visa Account Updater Service? VAU is a service that will provide card number and expiration date updates to merchants who maintain card-on-file (COF) account information to process recurring customer payments. Some examples of COF payments include: Netflix, Hulu or other streaming services; gym memberships; monthly utility bills; recurring charitable contributions; or insurance premiums. What does the service actually do? Account Updater Service (AUS) provides a way for GHFCU to communicate the most recent cardholder account information to Visa. Our data processor has created a special file format to send card details to the network on our behalf. In turn, Visa makes this information available to acquiring COF merchants who elect to participate in the service. What are the benefits of this service for my organization and cardholders? Cardholders will no longer have to provide updated card information to participating COF merchants when their card is reissued due to normal expiration or lost/stolen card. Recurring payments are more likely to be successful because updated card information is readily available to participating merchants. Call the GHFCU Call Center at 864.467.4160 for more information on the Visa Account Updater Service or to opt out of the service for your GHFCU Visa debit and/or credit cards. Visit www.scorecardrewards.com to view the catalog or register your card and get started earning rewards! Our low interest rate VISAs have no annual fee, no cash advance or balance transfer fees and a 25-day grace period for purchases. We also offer student VISA credit cards. Lost or Stolen Visa Credit Card? During business hours, call 864.467.4160.